Anytime we see photos of international naval exercises, involving many warships, large and small, what comes to mind is what we can call an ensemble of naval forces at sea. Such an ensemble often looks like a task force from what Admiral Mike Mullen, in 2005, then U.S. Chief of Naval Operations, called a global 1000-ship Navy. Admiral Mullen’s concept is a fleet that would comprise of “all freedom-loving nations, standing watch over the seas, standing watch over each other.” In spite of renewed great power competition, multilateral cooperation between the world’s navies must grow to deal with common threats and forge constructive bonds between nations. Classical naval battles were not always fought for portions of seawater but to ultimately influence events on land for economic benefits of the naval powers. Although usually configured as instruments of war, navies also deter war, promote peace, and in doing that, promote commerce, protect trade routes, ensure safety of people and goods on the high seas. Although navies all over the world are established to fight if it comes to that, navies are more than fighting instruments. Navies are also the most potent maritime security agency to prevent numerous illegalities capable of hampering the economic well-being and prosperity of their people. But within each maritime nation no navy or any other maritime security agency can do it alone. It is unfortunate that, for political, legal, and bureaucratic reasons, maritime security roles are fragmented among many agencies. For many reasons, international maritime security deserves some form of a global togetherness arrangement. A standing ensemble at sea is desirable and all littorals should be encouraged to join. After all the sea is one, by and large. It is interconnected and it is a universal habitat where Sailors and merchant ships carry out their duties. Naval customs and ceremonies in this habitat are similar where the conviviality of when navies make port calls is usually memorable in spite of the differing political positions of littoral nations. It is true that coastal nations have enormous potential benefits for having the fortune of facing the ocean, but there are some costs to bear and some investments to make to actualize their objectives. Many successful maritime nations have done that and are reaping huge benefits from their efforts. It is significant to look at a list of the largest economies in the world. They are invariably nations with a coast along a great body of water, and many can be considered maritime nations. Their maritime and naval investment efforts are bringing them wealth. They include the United States, Japan, Germany, China, United Kingdom, France, Italy and Canada. Others are Spain, Brazil, Russia, India, South Korea, Mexico, Australia, and the Netherlands. The other members of this exclusive club that Nigeria aspires to join are Turkey, Belgium, Sweden and Switzerland. It is not by accident that these international economic giants are industrial or industrializing nations. In addition they are vibrant maritime nations, trading nations, shipping nations, and nations with coherent national maritime strategy and appropriate naval forces to protect what they have. Even the land-locked Switzerland is no exception to this general maritime rule and route to economic greatness. Switzerland has a long tradition of civilian navigation, both on its lakes, rivers, and on the high seas. It has a civilian high seas fleet of merchant vessels, whose home port is Basel from where the country connects to the port of Rotterdam in the Netherlands and thus to the sea trade network. Swiss industry and commerce rely on this connection, exploited for centuries by Swiss Rhine barges, for a substantial part of their imports and exports. All these maritime economies and others that are striving to make it to the list of the top 20 have one thing in common. They have an enlightened appreciation of the importance of the sea, have developed coherent national maritime strategy and have considerable investment in merchant shipping and naval forces. From time immemorial navies have always been closely associated with the economic prosperity of their nations. This is so because navies that guarantee benefits to littoral states in terms of maritime trade and enjoyment of sea-based resources such as fish, shrimps, and oil are not hindered or stolen by other, more determined and better armed people. Navies, whatever names they are called, are also instruments of law enforcement at sea. Navies usually have robust, multi-capable platforms with mobility, flexibility and endurance. They have well-trained officers and personnel, and they carry lethal war-fighting capabilities which are adaptable to deterrence and to fighting determined and well-equipped pirates and terrorists at sea. Security of the seas is important and impacts us all. Today the enemies for which navies prepare are not only state actors. Given its open access to all comers, the sea has become a home of very many illegalities, a den of pirates, illegal bunkerers, crude oil thieves, smugglers, poachers, polluters, drug traffickers arms dealers, terrorists and other economic saboteurs. In view of the huge number and sophistication of these misusers of the sea, globally, navies are teaming up for maritime security protection, given their inbuilt scalable capabilities to deal with all eventualities. Therefore, opportunities are available for maritime forces to operate together regularly, and stamp out criminals and illegalities at sea. When this happens, the vision of the sea becoming a totally peaceful commune for humanity and for economic prosperity can become a reality. However, all this will happen only if the different political and economic systems allow naval operational harmony to prevail and if solutions can include poor littoral nations. In technological terms, these underdeveloped states are the weakest links in the chain of expected togetherness. For decades, the United States Navy has actively taken up the mantle of global leadership by promoting maritime security partnerships globally through sea power symposia and conferences, joint operational training and equipment transfer using under the auspices of the NIPO (Navy International Programs Office). The growth of multilateral cooperation among African navies with each other and the U.S. Navy is an excellent example of this principle in practice. Nations that understand this central purpose of navies equip them to optimize the naval strategy and thereby maximize returns of their investments. Those nations that ignore building and maintaining effective navies because they lack the vision, resources, the will, or are distracted by other political or security challenges on land, like Nigeria now bogged down by many political disorder and insurgencies, often become victims of national and international economic disillusionment. The realities in the world today suggest that no one nation can do it alone in maritime security. Admiral Harry Ulrich III, a former commander of U.S. Naval Forces Europe and Africa, once declared that “maritime security is a team sport.” No navy can do it alone whether at the global, regional, sub-regional and at the national level. 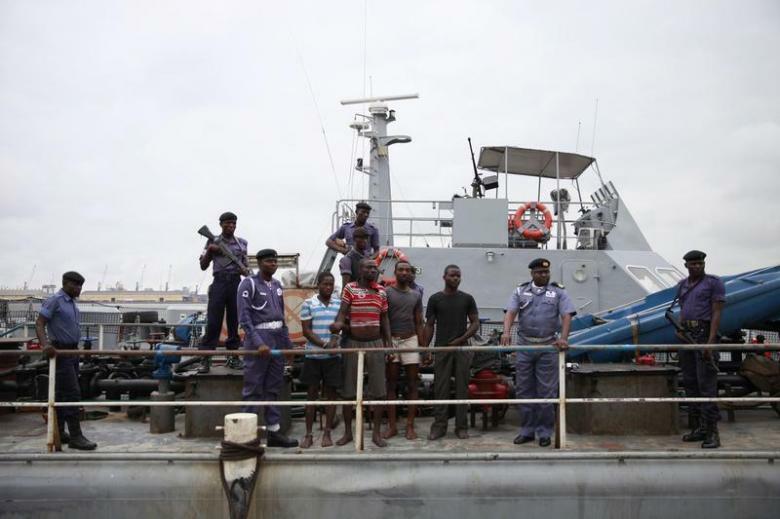 At the African regional level many calls have been made by successive Nigerian Chiefs of the Naval Staff, for African navies to cooperate to curb the activities of sea pirates in the continent’s coastal waters. For several decades, the American global naval system has been unrelenting in driving global, regional, sub-regional and national naval partnerships, especially in the West and Central Africa. What started as an annual Training Cruise in the 1970s has metamorphosed into a U.S. African Command, coordinating an annual multi-national maritime exercise appropriately named Obangame Express. It brings together African, European, South American, and U.S. forces to enhance cooperation and expertise in maritime security operations. Incidentally, “Obangame” which means “togetherness” comes from the Fang language of northern Gabon, Southern Cameroon and other parts of Central Africa. Obangame Express gives the partner nations the opportunity to work together, share information, and refine tactics, techniques, and procedures in order to assist the Gulf of Guinea maritime nations to build capacity to monitor and enforce their territorial waters and exclusive economic zones. The United States has not attained the commanding height of coordinating the international maritime security cooperation out of the blue. This status has come out of the many decades of persistent pursuit of sea power advocacy, of which African people and governments should buy into and support. The South African Navy, Nigerian Navy, Senegalese Navy, Ghana Navy, and other active navies in Africa should come together and learn to interoperate for the security and economic benefits of the region. But habits of togetherness, led by navies, should start within the maritime communities of each nation. This is the foundation on which international togetherness in maritime security can be built. European Union Navies: Multinational European Union Naval Forces (EU NAVFOR) are engaged in a multi-tasking deployment to counter piracy in the Horn of Africa, protect the World Food Program to Somalia, and give logistic support to the African Union troops on peacekeeping operations in Somalia. India: In 2009, against the backdrop of the Mumbai terrorist attack, the Union Government of India designated the Indian Navy as the authority responsible for overall maritime security, which includes coastal and off-shore security. The Navy will be assisted by the Coast Guard, state maritime police, and other central and state agencies. When the Minister of Defence announced the decision, he explained that the government decided to set up joint operation centers in Mumbai, Visakhapatanam, Kochi, and Port Blair. A national command, control, communication and intelligence network for real time maritime domain awareness would also be set up. Pakistan: Apart from a role in Cooperative Maritime Security, the Pakistani Navy is also undertaking independent operations to protect its flag carriers in the Indian Ocean and effectively counter threats posed to Pakistani economy due to rise in piracy incidents at sea. Canada: The Canadian Navy projects and protects Canada’s interests ashore and in distant places, it protects the passage of trade upon the seas, it participates in the monitoring of Canada’s ocean areas, and assists other government departments in the enforcement of Canadian maritime laws. For over two centuries the U.S. Coast Guard has safeguarded United States’ maritime interests in the heartland, in the ports, at sea, and around the globe. What is in a name? It may be called a coast guard, but it is reckoned to be the sixth largest navy in the world. It was configured from the very beginning as an “economic force,” so to say, with military readiness embedded. That makes the USCG a model navy for many third world countries. It is not surprising that it is the service of choice by the United States’ to woo coastal nations in Africa and other parts to the world to be maritime security partners. China: China has come out boldly to proclaim that it needs “a strong navy to protects interests.” And that China needs a strong navy to protect its interests on the high seas, too. This is against the backdrop of what China sees as unnecessary apprehension in the West about the on-going revival of the Chinese Navy. The Chinese aircraft carrier and its trial runs reflect the Chinese Navy’s growing competence in defending the country’s sovereignty and maritime interests. With a coastline of 18,000 kilometers, more than 6,500 islands, and about 3 million square kilometers of maritime area, China needs a strong and modern navy to prevent any violation of its territory, sovereignty over the islands and maritime interests in its waters. The country became the world’s largest exporter in 2009 and imported 63 percent of its iron ore and 55 percent of its crude oil needs in 2010. The safety of China’s personnel, assets and shipping lanes is very important for its economy. Gulf of Guinea Navies: In consonance with global developments and best practices, the Gulf of Guinea navies which were before isolated, are now teaming up to fight the menace of sea piracy in the sub-region. The current global concern about the Gulf of Guinea also has to do with the area’s growing importance as an oil producing region, leading the U.S. to increase its military presence in the area. 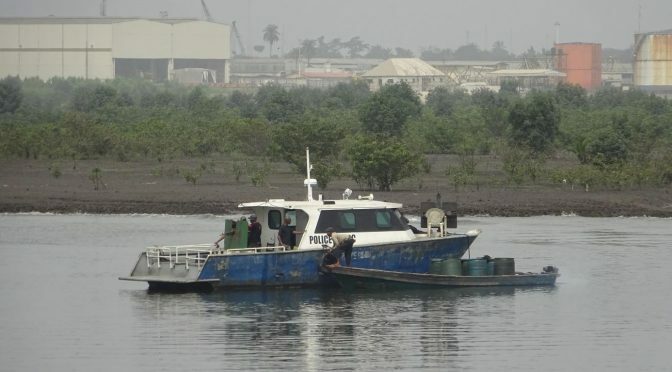 Nigeria: Nigeria is a nation with the good fortune to have a considerable coastline sea and an economy critically dependent on the ocean resources and marine transportation. Promoting, coordinating and enforcing safety regulations in the territorial waters and the EEZ of Nigeria. 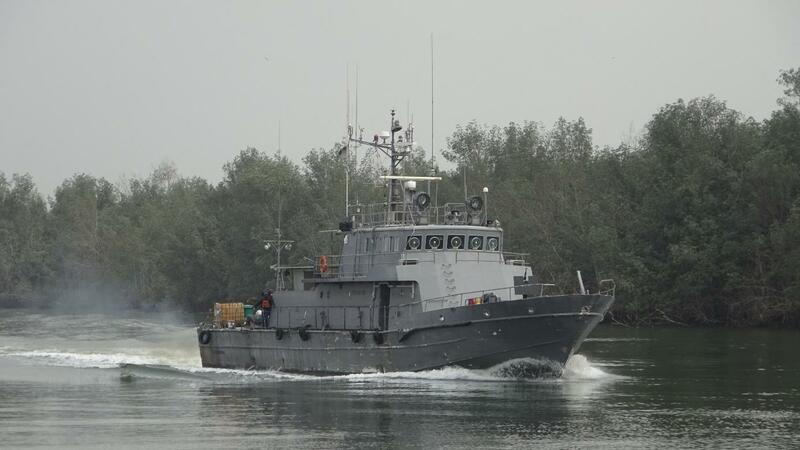 Add to all these, sea piracy, human trafficking, narcotic smuggling, marine safety, search and rescue, and pollution control are also a part of the Nigerian Navy’s missions. Expectations by Nigerians for their Navy are very high. But few are aware of two decades of decline of the Navy’s fleet. 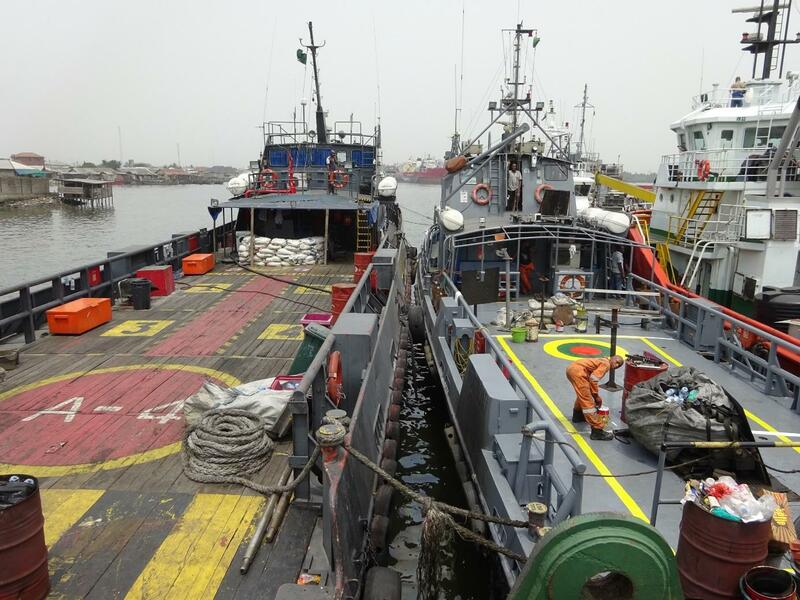 In addition many people are not aware that coastal security is a complex issue which requires seamless coordination across numerous government departments and agencies such as NIMASA, NPA, Customs, Immigration, Marine Police, and Inland Waterways. It also requires the setting up of technological expensive infrastructure. All that will cost a lot of financial resources. But there are arguments in maritime security quarters that the required money can be made available if policy makers focus on costs and benefit thinking. That means they should fund the Nigerian Navy appropriately as a leading African nation in the world. The international environment is one of violent peace, occasioned by sea piracy and many other illegalities at sea. This is stimulating the teaming up of global, regional, and coastal navies for collective maritime security. 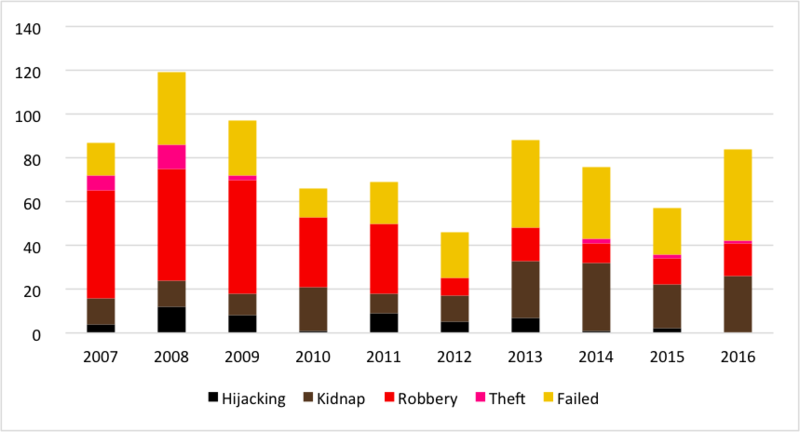 Also within coastal nations are a cornucopia of threats to peaceful resource enjoyment – from militants, pirates, illegal bunkerers, drugs, traffickers, and terrorists. The bottom line is that across the globe navies are being charged with the leadership of the maritime security of their nations. But no navy can perform without significant legislative and financial support from national leaders. You can’t be an effective team player if you can’t get on the field. Olutunde Oladimeji is a retired commodore of the Nigerian Navy. He is a 1972 graduate of Mass Communication, University of Lagos and earned a Master’s degree in International Relations from OAU University, Ile-Ife. He served in the Nigerian Navy for 22 years and finished as Director of Naval Information and Plans before retiring in 1994. He has written many books and articles for defense and naval magazines, including the U.S. 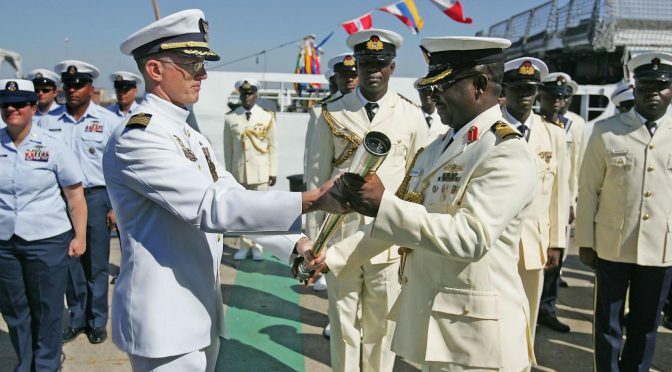 Naval Institute Proceedings and has participated in many maritime security-related conferences in Nigeria and abroad. 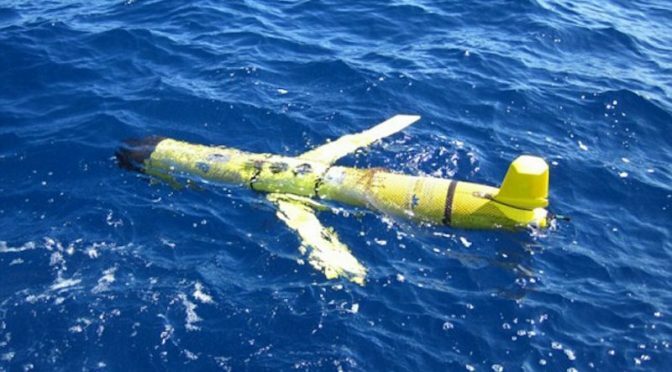 On December 15th 2016, the Chinese Navy seized an American unmanned underwater vehicle (UUV) operating in international waters off the Western coast of the Philippines. 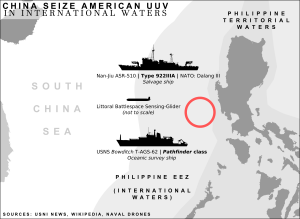 The USNS Bowditch, an unarmed T-AGS class hydro-graphic survey ship, was being shadowed by a People’s Liberation Army-Navy (PLAN) salvage vessel identified as a Dalang-III class (ASR-510). The UUV had surfaced as part of a pre-programmed instruction, and sent a radio signal marking it’s position for pick-up. As the Bowditch was preparing to recover the drone from the water, a small boat crew from the Dalang III raced in and plucked the unmanned vessel. The incident occurred approximately 50 nautical miles northwest of Subic, Luzon. While the exact type of drone is unknown, there have been several instances of U.S. Navy Slocum Gliders snagged in local fishermens’ nets or washed ashore on beaches in the Philippines. This type of drone is not weaponized, and is used to collect a variety of environmental readings such as water temperature and salinity, to improve forecasting accuracy of extreme weather such as typhoons. The UUV uses wave movement to propel itself without any on-board engines, with an endurance time of months. The Department of Defense estimates the seized drone’s value to be around $150,000. The crew of the Bowditch immediately contacted the PLAN vessel on bridge-to-bridge radio asking for the return of the drone. The PLAN vessel reportedly acknowledged the message, but then stopped responding and sailed away with the UUV. On Friday the 16th, the U.S. State Department issued a formal protest, or demarche, with the Chinese Department of Foreign Affairs, demanding an immediate return of the drone. At the time of this article’s publication, the Chinese government has not responded. Notably, the Philippines has chosen to remain silent over the incident. While traditionally a U.S. ally, the election of President Rodrigo Duterte has brought a deterioration of relations between Manila and Washington. Thanks in no small part to Duterte’s bloody prosecution of an Anti-Drug war punctuated by high civilian casualties and accusations of extra-judicial killings, a large multi-million dollar U.S aid package was just withdrawn this week – prompting the volatile President to threaten abrogation of the Visiting Forces Agreement. The Philippine Department of National Defense indicates they had no idea that the incident was ongoing; highlighting the enormous capability gap the Philippines has regarding Maritime Domain Awareness. The Philippine government became aware via communications from the U.S. State Department to their embassy in Washington D.C. Coupled with Duterte’s increasingly close orbit of China following last month’s visit to Beijing, the United States could potentially find itself without bases that would ease the mission of maintaining a robust presence in the South China Sea. Recent analysis shows China has expanded militarization of their Spratly Island outposts by placing what appear to be defensive anti-aircraft and close-in weapon systems on Hughes and Gaven reefs, while fortifications have sprouted on Fiery Cross, Mischief and Subi reefs; the latter group are in close proximity to other claimant outposts in the region. Taken together, China appears to be using it’s famous “Salami-slicing” techniques to slowly ratchet up its presence and capabilities within the region without crossing any significant “bright lines” leading to a military confrontation. The UUV seizure is consistent with opportunistic interference of U. .Navy operations while striking propoganda points with regional states. Notably, the unresponsiveness of Philippines to an international incident within their EEZ tells a tale that the U.S. cannot count upon its traditional ally going forward to assist in the presence mission. Armando J. Heredia is a civilian observer of naval affairs. He is an IT Risk and Information Security practitioner, with a background in the defense and financial services industries. The views and opinions expressed in this article are those of the author, and do not necessarily represent the views of, and should not be attributed to, any particular nation’s government or related agency. Welcome to the September 2016 members’ roundup. Throughout the month, CIMSEC members examined several international maritime security issues, including the successful testing of Raytheon’s SM-6 surface-to-air-missile by a Ticonderoga-class Aegis cruiser, developments surrounding the Littoral Combat Ship (LCS) program, the rise of non-state actors in international maritime security affairs, continued hostility between China and regional nations relating to the South China Sea maritime disputes, and the worsening of security tensions between American and Russian air and naval forces patrolling the Black Sea. Dave Majumdar, for The National Interest, discusses the Raytheon SM-6 Standard surface-to-air missile test that recently set a new record for the longest-range over-the-horizon intercept in naval history. The interceptor, which also has a long-range anti-ship variant, is a central component of the U.S. Navy’s Naval Integrated Fire Control – Counter Air (NIFC-CA) battle network. He highlights that the missile is effective against cruise missiles, aircraft, ballistic missiles, and enemy surface combatants while its range is estimated to be as great as 250 nautical miles. He also explains that the SM-6 interceptor is a major reason for why the U.S. Navy is confident in its ability to operate in highly contested environments, including regions where near-peer competitor powers have employed anti-access/area-denial weapons, such as the Baltics or the Western Pacific. Bryan McGrath, for Scout Warrior, provides several recommendations for how the U.S. Navy should methodically approach future fleet architecture and force structure planning. He explains that developing the fleet to meet the challenges of great power competition should be central to this approach, largely because the capabilities this requires will allow for other critical security demands to be met as a byproduct, including control over trade routes, combating non-state actors, and enforcing maritime security. He also suggests that the relationship between the Navy and the Marine Corps should be funded as an asymmetric advantage unique to American seapower capabilities, while Congress should increase the overall resource allocation the Navy receives in order to meet the rigors of growing great power dynamics and the increasingly complex, multi-domain operational objectives associated with those adversaries. Steven Wills, for U.S. Naval Institute News, provides a review of the changes made to the Littoral Combat Ship (LCS) program and explains that although the ships’ new training procedures, modularity, and operational organization may seem revolutionary, these new features simply reinforce the ship’s core missions. He explains that the majority of the LCS force will be forward deployed in support of operational commander tasking while personnel swaps will be undertaken to keep the ships forward deployed for longer periods of time. He also adds that mission modules will be exchanged between different LCSs to meet strategic operational requirements. Although the LCS has received significant opposition from both military and political officials, he notes that the large numbers of LCSs planned for forward deployment will meet the fleet’s specific demand for 52 small combatant vessels, and more generally, the need for increased warfighting capacity across the force. Paul Pryce, for The NATO Association of Canada, discusses the rise of non-state actors across the international maritime environment, highlighting the People’s Liberation Army Navy (PLAN) and the Chinese Coast Guard’s training and funding of fishing militias to support China’s territorial claims in the South China Sea. He explains that the advent of these actors and their practices represent an overall increase in hybrid warfare on the oceans, a development which is likely to undermine regional security across the highly contested waters in the Asia-Pacific. With non-state actors offering plausible deniability for the states that support their activities, he suggests that states should seek greater cooperation in the enforcement of international maritime law by launching frequent and functional joint patrols as a means of building mutual trust between countries. He explains that this trust will increase constructive dialogue towards resolving ongoing disputes and will mitigate the tensions non-state actors and militias can induce between nations. Alex Calvo, at Japan Times News, is quoted in an article discussing the South China Sea and the maritime and territorial disputes surrounding Scarborough Shoal. He explains that China will likely make a move to increase their strategic posture near the Shoal, largely because the U.S. and regional allies have not explicitly threatened to use force to prevent such an action from occurring. Sam LaGrone, for U.S. Naval Institute News, provides an update on the Russian Sukhoi Su-27 Flanker fighter aircraft that came within 10 feet of a Navy P-8A Poseidon surveillance aircraft over the Black Sea. 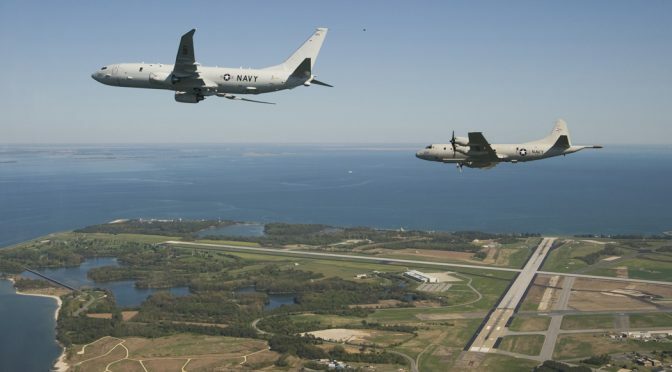 He notes that P-8A patrol aircraft are becoming increasingly active in the region as the Russian Navy expands its submarine presence in the Black Sea. Mina Pollmann, for The Diplomat, provides an analysis on the bankruptcy of South Korean shipping giant, Hanjin Shipping Co. She highlights the significance of the company’s 2.9 percent global market share of container shipping, and that the primary capital lenders for the company, led by the state-run Korea Development Bank, rejected the company’s restructuring proposal – ultimately resulting in Hanjin Shipping Co.’s bankruptcy protection. Christian Davenport, for The Washington Post, discusses the recent explosion of a SpaceX rocket and the comments made by the United Launch Alliance (ULA), who suggested that the explosion demonstrates the risks associated with choosing the lowest bidder on sensitive national security launch contracts. Kyle Mizokami, for Popular Mechanics, analyzes the U.S. Air Force’s proposal for Ground Based Strategic Deterrent (GBSD), which is intended to replace the Minuteman III land-based intercontinental ballistic missiles (ICBMs). He adds that GBSD will be designed to last until 2075, upgrade the nation’s ICBM force with new technologies, and will be cheaper to operate – with an estimated price tag between $62 and $85 billion dollars. John Grady, for U.S. Naval Institute News, discusses the decision by the U.S. House of Representatives Armed Services Strategic Forces Subcommittee to explore reforms on how the military uses space, and how the creation of a new command or agency for these operations may be necessary. In a second article at USNI News, he reviews comments made by the head of U.S. Strategic Command concerning North Korean nuclear testing and the development of more powerful rocket engines that could be used to deliver nuclear weapons to the United States. Ankit Panda, for The Diplomat, discusses China’s recent People’s Liberation Army Air Force (PLAAF) exercise where more than 40 aircraft flew through the Miyako Strait in the East China Sea. He explains how although the Japanese Air Self-Defense Force (JASDF) scrambled fighter aircraft in response, no Chinese aircraft encroached on Japanese territorial air space. At CIMSEC we encourage members to continue writing, either here on CIMSEC or through other means. You can assist us by emailing your works to dmp@cimsec.org. Sam Cohen is currently studying Honors Specialization Political Science at Western University in Canada. His interests are in the fields of strategic studies, international law and defense policy.